The empirical study of consciousness is in constant progress. New ideas and approaches arise, methods are being debated and refined, and experimental research over the last two decades has produced a rich body of data, acquired in the aim to better understand consciousness and its neural underpinnings. 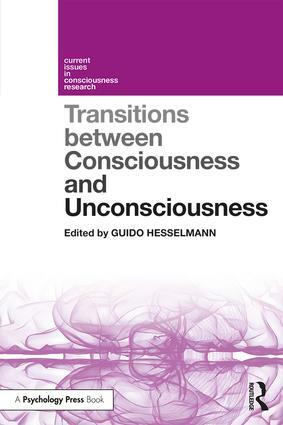 This volume synthesises this data, focusing on how to understand the relations and transitions between consciousness and unconsciousness alongside exploring and distinguishing conscious experience of sensory stimuli and unconscious states. Bringing together leading academics and promising young scientists from across the fields of psychology and neuroscience, Transitions between Consciousness and Unconsciousness discusses controversial topics and ideas, providing an overview of current research trends and opinions, as well as perspectives on theoretical and methodological questions. This is an essential volume for consciousness researchers and students from across psychology, neuroscience and philosophy, as well as those researching modes of visual processing. Chapter 1 - The breaking continuous flash suppression paradigm: Review, evaluation, and outlook. By Timo Stein. Chapter 2 - What’s up with high-level processing during continuous flash suppression? By Pieter Moors. Chapter 3 - Unconscious Visual Processing: How a Neuro-functional Hierarchy Can Guide Future Research. By Bruno Breitmeyer & Guido Hesselmann. Chapter 4 - The unconscious processing of social information. By Apoorva Rajiv Madipakkam & Marcus Rothkirch. Chapter 5 - Studying the benefits and costs of conscious perception with the liminal-prime paradigm. By Dominique Lamy, Eyal A. Ophir, & Maayan Avneon. Chapter 6 - From aliens to invisible limbs: The transitions that never make it into conscious experience. By Jaan Aru. Guido Hesselmann is a professor of General and Biological Psychology at the Psychologische Hochschule Berlin (PHB), Germany.